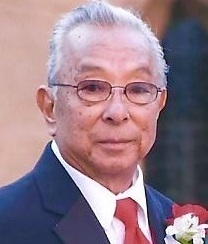 JAMES MITSUNORI TSUTSUMI James Mitsunori Tsutsumi (76) of Honolulu, Hawaii passed away on Monday, November 7, 2017 lovingly surrounded by family in his Winston-Salem home. He was born on September 24, 1941 on the island of Oahu to the late Hisao and Chisato Tsutsumi. He is survived by his daughter, Maile Victoria Tsutsumi Harding and son-in-law Dr. Tom Harding. He also leaves behind two brothers; Norman (Thelma) and Milton (Carol) Tsutsumi as well as, four sisters; Florence Nakamura, Eleanor Young, Amy Fukunaga and Lynn Tagawa. Mr. Tsutsumi served in the U.S. Armed Forces for an extended tour in Korea before returning home and securing a job with the telephone company as a PBX installer. He was the type of person who would give you the shirt off his back if you needed it and will forever be remembered by friends and family for his love of golf, fishing and travel. His celebration of life was held at the family's home on Sunday November 12, 2017 at 3:00p.m.